5-HTP / 30 Tabs - Nature's Way®. 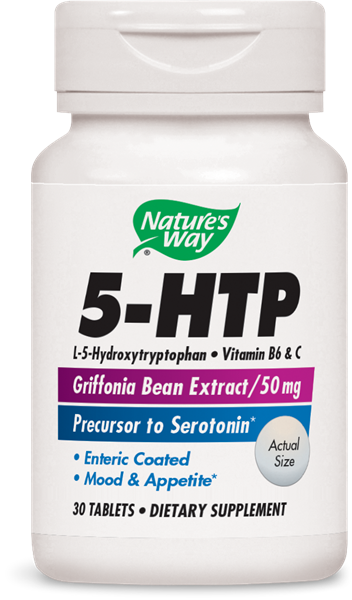 Nature's Way® uses 5-HTP extracted from Griffonia simplicifolia beans. Take 1-2 tablets three times daily with meals, or as recommended by a healthcare professional. This product should not be consumed by children under the age of 12 years, or by pregnant or nursing women. Some may experience gastrointestinal (GI) upset including abdominal cramping, nausea, or diarrhea while taking this product. As with any supplement, if discomfort persists discontinue use. Those suffering from GI disorders such as ulcers, irritable bowel syndrome, Crohn’s disease, ulcerative colitis, or celiac disease, should not use 5-HTP. Those taking prescription anti-depressants should not use 5-HTP. Do not take this product if you have or are taking medications for epilepsy, scleroderma, or Parkinson’s disease. This product may cause drowsiness, and should not be used while driving or operating heavy equipment.